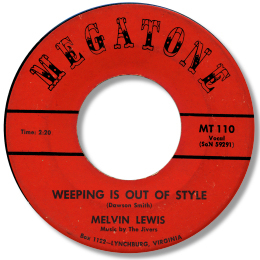 Like Jimmy Brown and Robert Tanner, Melvin Lewis was a member of the Jivers out of Lynchburg, VA. And like them, he recorded for the local Megatone concern before the self-contained group cut their legendary LP as the New Sound which came out on Turbo. However, Weeping Is Out of Style never made it to the album nor indeed out of Virginia. But it should have as it is very good indeed. In front of “chirpy” saxes and a strong plodding rhythm from the Jivers, Lewis shows plenty of gospel flourishes in his baritone vocals. This is just the sort of deep southern soul that deserves a much bigger audience. More information on the Jivers and their recordings can be found on the Robert Tanner page here. DJ Mad Lad Robert who provided this info also mentioned that "Melvin Lewis is now in the ministry!"